Although the facilities offered are a standard affair familiar to regular drivers, the building here looks deceptively grand. First two hours free for all vehicles. Further details aren't available, please update this if you know. The tall restaurant area in 2012. Planned in 1987 as Swanwick services, Alfreton was part of Granada's plans to expand Granada Hotel. This one was styled to be particularly grand, with its large building and garden fronting the road, as well as the covered walkway at the entrance. There is a small, unused terrace at the front of the building and the toilets are in a small, separate area. After Granada decided to leave hotels, this place was sold to Trusthouse Forte and they turned it into a Little ChefHistory/Burger King/Travelodge combination in around 1994. This fell back under the responsibility of Granada when they took over Trusthouse Forte in 1995, and was subsequently sold on again. Granada signage was covered up by 'Little Chef'. Much of the original car park is now used by the neighbouring business park. There is a community fire station here too. Euro Garages took over the restaurants in 2017, and were forced to change the Little Chef to a holding name, EG Diner. 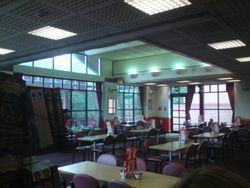 The EG Diner closed on 15 August 2018 with the Burger King closing the following day, to allow the dining area to be refurbished. It later reopened in October 2018 with a Burger King and Greggs replacing the EG Diner. The filling station formerly included a Costcutter store. 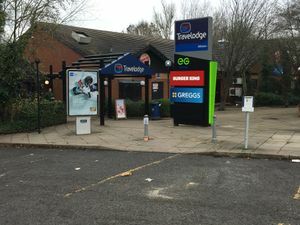 During June 2018, MFG submitted a planning application to redevelop the existing filling station shop. These plans include removing the car wash and plant room to make way for a new shop and parking area. The current building will become a Subway sandwich shop. The plans were approved in August 2018.